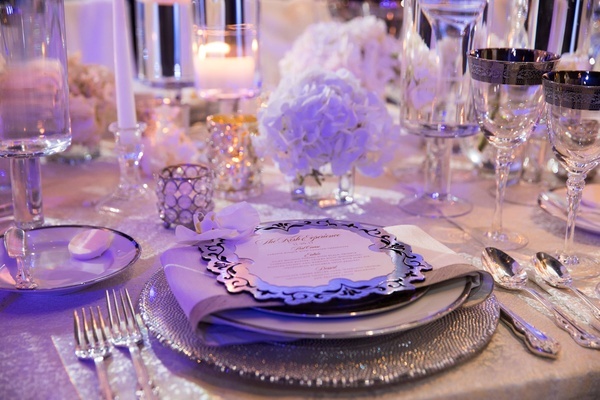 “We wanted to create a design that was very monochromatic – a balance between white décor and fire and ice,” says Akeshi Akinseye of Kesh Events as she describes her styled shoot inspired by what she calls "frosted opulence." 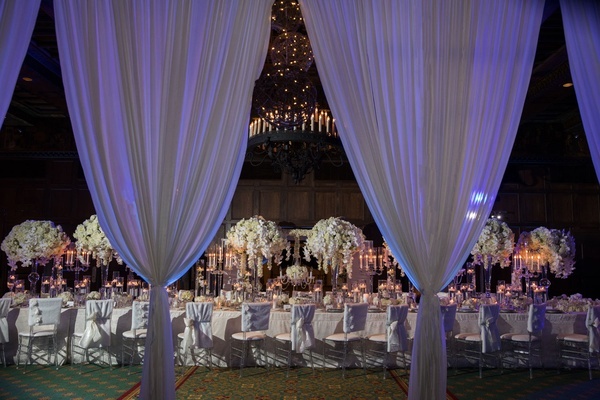 Envisioning a very regal ambience for the shoot, Akeshi and her team of vendors adorned a Chicago venue with a plethora of white blooms. 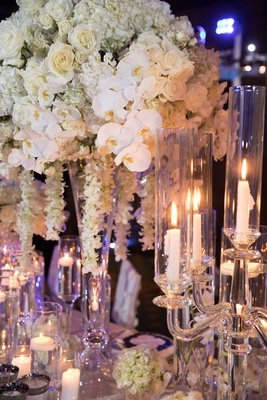 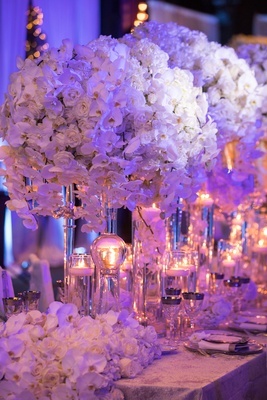 The grand floral arrangements showcased plump roses and cascading orchids, which perfectly paired with the white linens and drapes decorating the ballroom. 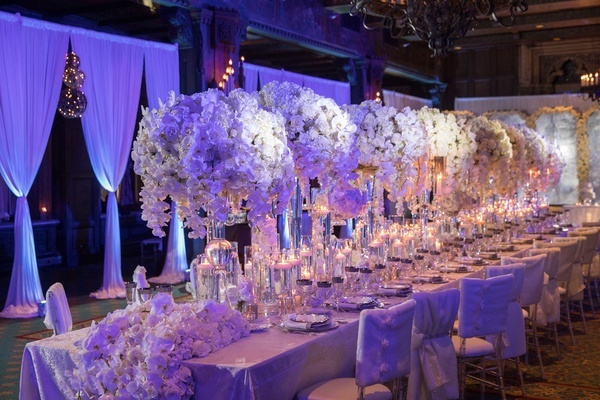 The long banquet table also featured lovely roses in small glass vases and a single orchid bloom atop each guest’s menu. 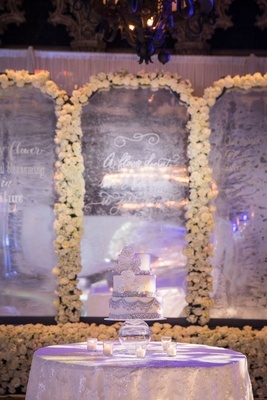 The reflective walls nearby were bordered by white blossoms, which beautifully complemented the floral quotes that were written in different fonts on each wall. 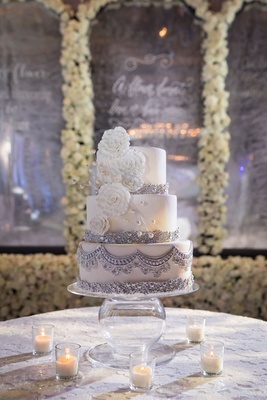 This served as a backdrop for the two-toned, three-tiered confection, which was designed with fondant cascading flowers, stemmed pearls, and silver jewelry-esque trim that mimicked the bridal looks. 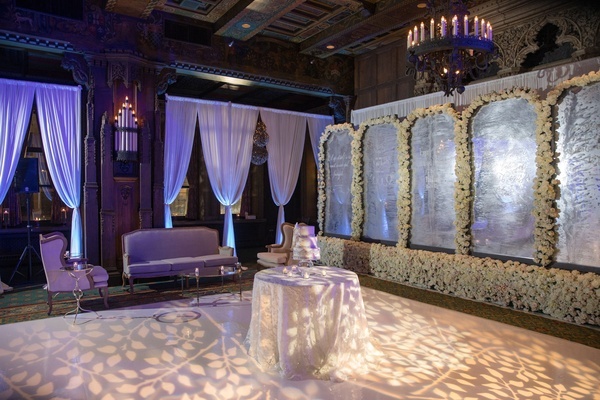 The fire-and-ice motif was executed through the vendors’ use of light throughout the venue. 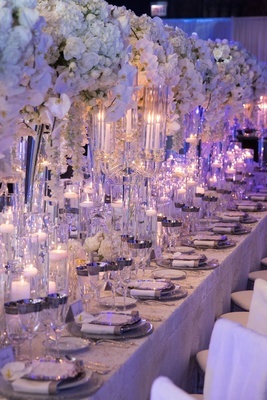 Violet lighting was fixated on the banquet table, creating a cool, icy aura that was juxtaposed with the fire of the candlelight. 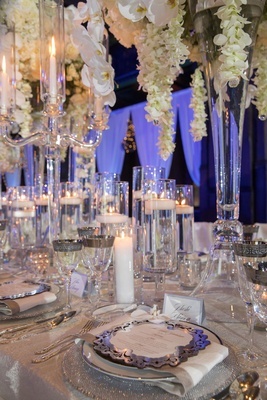 In spirit of the motif, the table was also decorated with many small candles that floated in glasses of water, which enlightened the bright white of the floral arrangements. 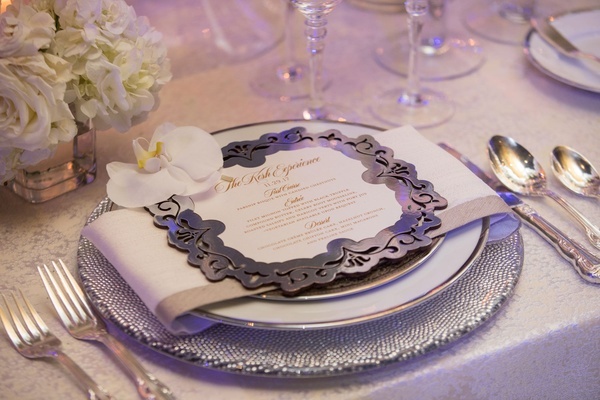 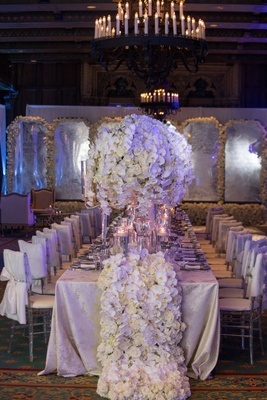 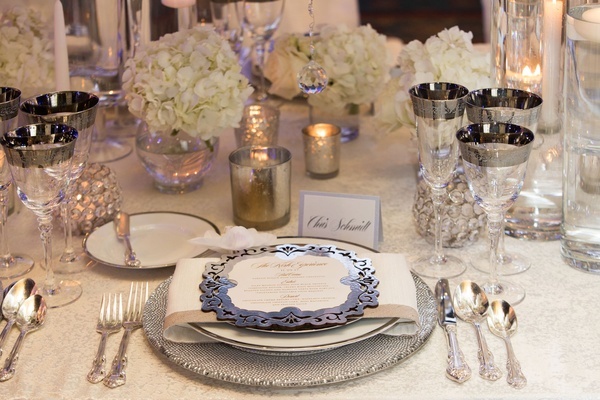 This unique design complemented the frostiness of the bride’s wardrobe as well – particularly the gown worn at the table. 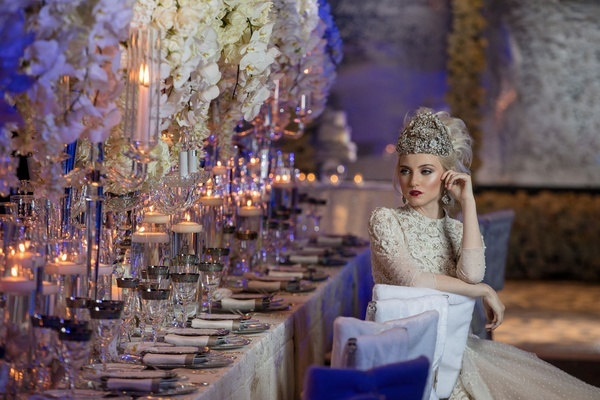 She donned a gorgeous long-sleeved gown of lace and sheer details that was embellished with crystals and pearls and accompanied with an extravagant silver headpiece. 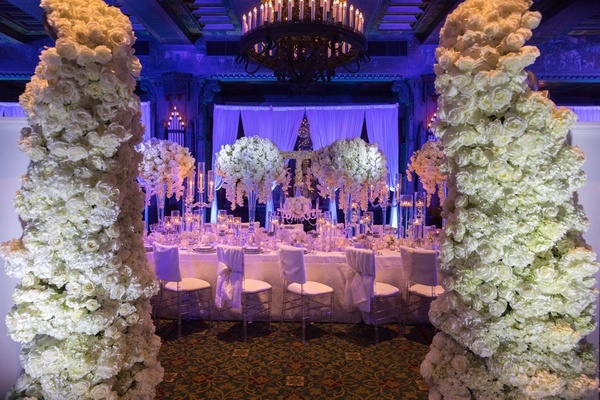 The dress gleamed as the bride posed amidst the blooms and candlelight, creating an extraordinary atmosphere fit for a royal occasion. 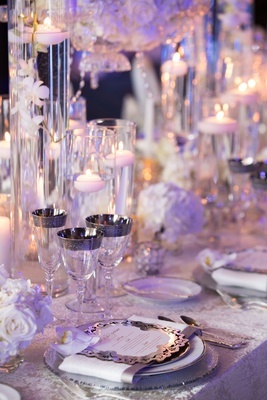 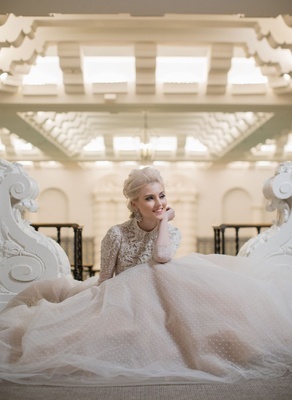 Every detail of the styled shoot contributed to its opulence and showcased how fire and ice can make a lovely pair – especially for a winter wedding.